This weekend I headed down to Yonge-Dundas Square to catch a little of the Small World Music Festival. They had a terrific lineup, and one of my favourite live acts was playing – Raging Asian Women. 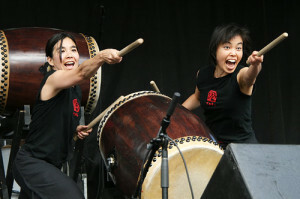 Taiko drumming is a traditional Japanese form of performance where musicality and showmanship are both important, and RAW have it down. The first time I saw them was years ago, at a conference, and I’d had no idea what to expect. I’d seen and loved Taiko performances before, but nothing prepared me for the power of RAW. By the end of their performance, I had tears streaming down my face – not from sadness, but from being genuinely moved beyond words by what they brought to the stage. RAW is a collective, a group of East and Southeast Asian women who have been training together and performing since 1998. There’s something transformative about their performances; the rhythms are exciting, and quicken your blood. 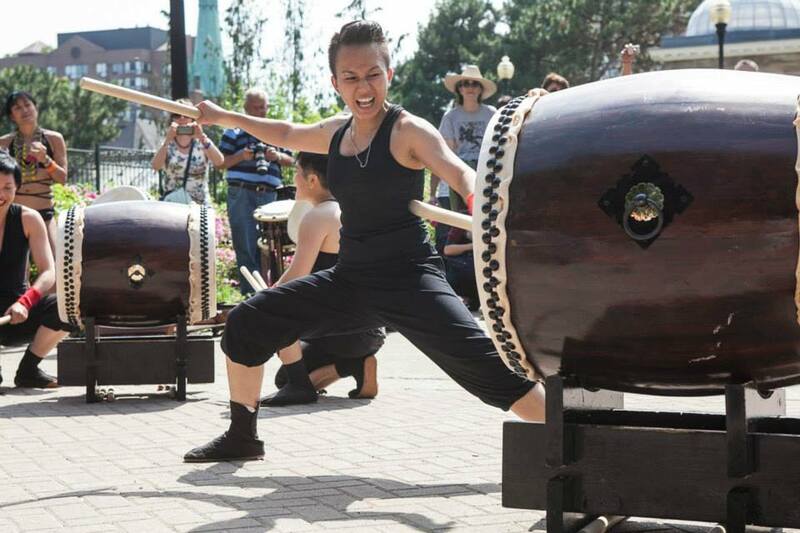 But even more, watching their beautiful strength and fierce joy as they pound out beats, perform complex choreographies and engage audiences with an athletic energy that has young and old raring for more is exhilarating. I booked them to perform at the Peterborough Folk Festival years ago, and held my breath as they took to the stage, hoping the audience would go with us as we deviated from the path of melody-based musical performances. After the first song, there was a pause of a few seconds – which felt, to me, like an eternity – and then the audience roared to their feet, cheering in wild appreciation. The energy between the band and our audience was one of those magic things that only happens during a live performance, and it’s been a touchstone ever since – being a part of that moment is fuel when the long hours and low wages of a career in the arts get me down. This is my kind of feminism; inspiring and skillful and not afraid of the word. These are artists worth supporting, who understand that there is power in performance and that you can use that platform to change the world. These are people who understand that sometimes the way you do something is as important as the thing you do. If you can see them live, do; it might change your life.